Etixx-QuickStep – the Belgian WorldTour team formerly known as Omega Pharma-QuickStep – has unveiled its kit for the 2015 season, as modelled by British sprint star Mark Cavendish. It’s not so much of a redesign as a simple swap in sponsor names with some subtle tweaks, looking very similar to the 2014 Omega Pharma-QuickStep strip. If it ain’t broke, as they say, don’t fix it, and the team’s strip is instantly recognisable in among the multi-coloured jumble of the pro peloton. Clothing designer Vermarc has kept the basic colours for the team kit as black, white and blue. In the case of former world champion Cavendish, that jersey also includes the rainbow stripes around the arm cuffs. 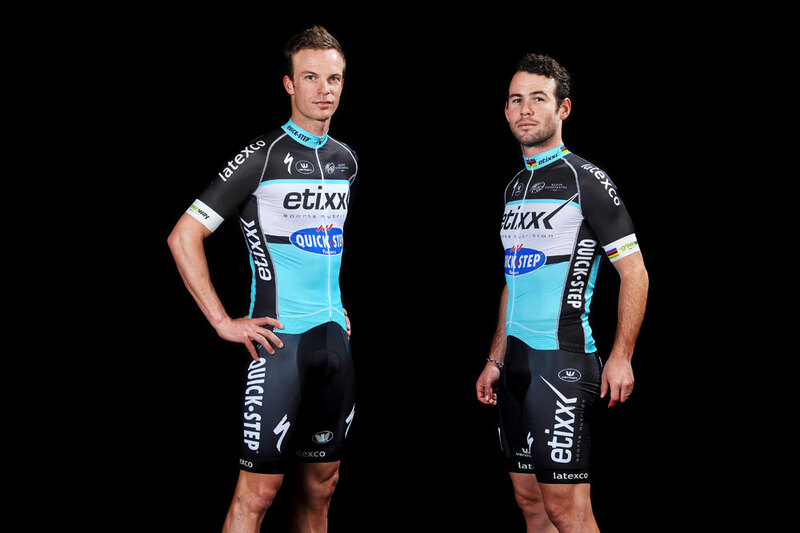 It was announced back in July that Etixx would replace Omega Pharma as the team’s headline sponsor. Etixx is a sports nutrition brand that is part of the same group of companies as Omega Pharma. Long-term cycling supporter QuickStep flooring remains firmly on board as co-sponsor. Cavendish and team-mate Iljo Keisse have had a busy winter so far, placing second at the Ghent Six Day track meet and winning the Zurich Six.